While Apple's Continuity feature allows users to place calls and texts within its own ecosystem of products, AT&T plans to bring those same capabilities to a range of LTE-capable devices sharing the same phone number, regardless of platform, thanks to a new service called NumberSync. 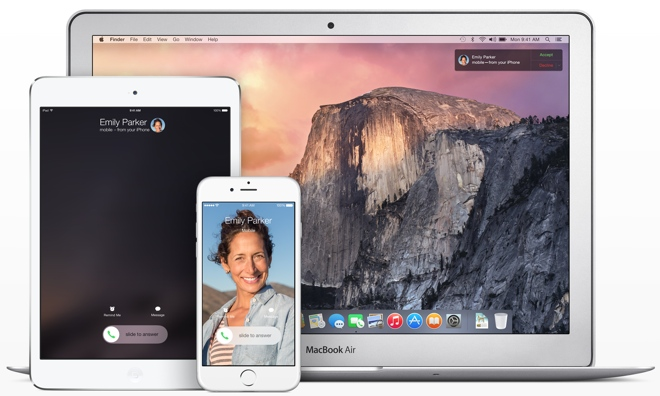 Apple's Continuity requires devices running iOS 8 or OS X 10.10 Yosemite or later, and they must be connected to an iPhone via Bluetooth or Wi-Fi for features such as SMS text messages and traditional phone calls. But AT&T NumberSync will operate on the carrier's wireless network with LTE-connected, registered devices, meaning it isn't dependent on a Bluetooth connection to the user's smartphone. NumberSync will work even if a user's smartphone isn't near their other devices, or even if it's completely turned off. While Apple's Continuity is free with the company's latest hardware and software and an Apple ID, AT&T NumberSync will require an LTE-connected device registered to a shared data plan. Though AT&T's announcement on Wednesday didn't specifically mention Apple, the carrier said it's working to bring it to future connected devices, regardless of hardware manufacturer or operating system. AT&T plans to bring the first NumberSync device to market "soon," with additional devices set to launch this holiday. "We're taking a standards-based, network approach that will make connecting a wide variety of devices easier to give you a better user experience," AT&T Chief Marketing Officer David Christopher said in a blog post. "Our plan is for NumberSync to become the norm on a variety of our future connected 'devices.'" NumberSync will work with tablets and wearable devices with integrated cellular radios. It will be offered at no extra charge beyond the $10-per-device fee AT&T charges per month for a connected tablet or smartwatch. That means that at launch, Wi-Fi-only devices —like the Apple Watch, Apple's Mac lineup, or certain iPad models— won't feature compatibility. In comments to Engadget, the company said only LTE-compatible devices officially added to a Mobile Share data plan will work. Apple's Continuity, meanwhile, is free for users who own an up-to-date iPhone, iPad or Mac. There are also technical changes that device makers, including Apple, will need to make if NumberSync will come to their platform. For example, the iOS Phone and Messages apps would need to be modified to support AT&T's NumberSync network. Though NumberSync won't work with Wi-Fi, AT&T did begin enabling Wi-Fi calling for iOS 9 users last week, giving subscribers the ability to place calls via their home wireless network and bypass its own LTE signal. Rivals T-Mobile and Sprint have offered Wi-Fi calling on compatible devices for some time.